Rand Paul versus Marco Rubio: The Kentucky senator needles the Florida senator over Cuba on Twitter. 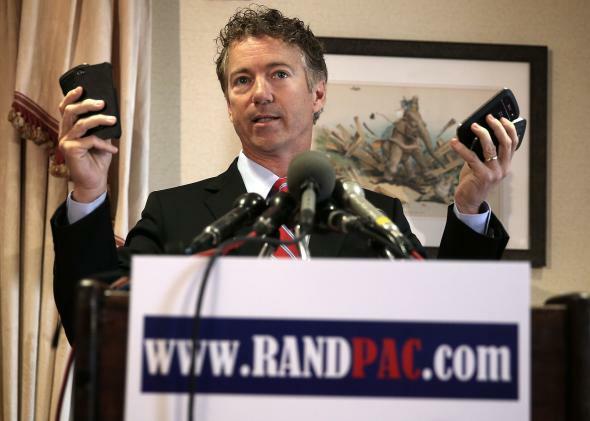 Rand Paul likes his Twitter devices. Today in news from the world’s greatest deliberative body, Sen. Rand Paul tried to pick a Twitter fight with Sen. Marco Rubio. The two Republican senators and likely presidential candidates have opposite stances on the president’s move to normalize U.S. relations with Cuba; Paul said the change is “probably a good idea” and that the embargo hasn’t worked. Rubio, meanwhile, has probably been the single most vocal opponent of the decision. Friday afternoon, Paul took to social media to needle the Floridian. Hey @marcorubio if the embargo doesn't hurt Cuba, why do you want to keep it? Senator @marcorubio is acting like an isolationist who wants to retreat to our borders and perhaps build a moat. I reject this isolationism. The United States trades and engages with other communist nations, such as China and Vietnam. So @marcorubio why not Cuba? Dubbing Rubio an isolationist is particularly trollish. The former ophthalmologist has long struggled to dodge charges that he favors isolationism, even writing a Time op-ed with a headline to that specific effect. Unfortunately for fans of Twitter fights, Rubio didn’t initially respond to Paul, and his press shop didn’t immediately respond to a request for comment. This isn’t the first time Paul has engaged his Senate colleagues on Twitter. Last Dec. 23—I don’t need to tell you that’s Festivus—the senator aired grievances in a lengthy series of tweets with New Jersey Democrat Cory Booker. One more Festivus grievance about bipartisanship. @CoryBooker doesn't RT me enough. The two senators proceeded to discuss the War on Drugs, and later worked together on sentencing reform legislation.